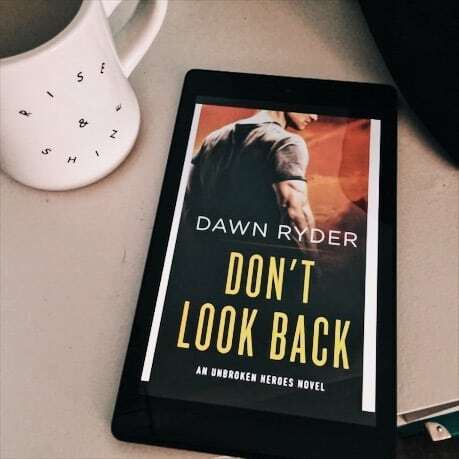 Don’t Look Back is the sixth and final installment of the Unbroken Heroes series by Dawn Ryder. We finally get Dunn’s story and it’s a great one to complete the series. This is a romantic suspense, and I’m pleasantly surprised to read just as much suspense as romance. That was one of the major reasons I liked this book and this entire series. The suspense has a purpose and a reason. Thais Sinclair is a Shadow Ops agent but she’s perfectly happy working alone on her designated missions. She has a load of personal and professional baggage that keeps her back to the wall and all senses on alert. When she falls on the sword and finds herself in the interrogation room at Homeland Security, she’s perfectly willing to lose her life or quality of life for her mission. To put it bluntly, she’s a loose cannon with little regard for her personal happiness. She’s the job and that’s all she ever wants to be. Dunn Bateson doesn’t need any help in completing his personal mission to protect his mother. However, he’s been saddled with Thais and he’s a little more intrigued by her than he wants to admit. Former MI6, he’s perfectly capable of wielding guns and he’s conveniently wealthy enough to have serious connections needed to keep his mother, a congressional hopeful, from the crosshairs of a hitman. But with Thais wasting away at Homeland, maybe he can accomplish two things: save his mother and prove to Thais that she is worth saving, too. I definitely think reading the previous books in the series is almost mandatory. I don’t think this book can be read as a stand-alone. There was a lot of character development in previous books and some need-to-know information the reader should have before taking in Dunn and Thais. That being said, I LOVED Thais. At times, I wanted to shake her silly because she was a little too independent. Resting on her laurels in a heated room at Homeland was no picnic because she spent way too much time inside her own head. However, she was a badass professional agent when the action kicked in for her rescue, attempted re-kidnapping, attempted murder, etc. There was plenty of action and suspense to keep this book interesting. Now for Dunn, I wanted his happily-ever-after and I finally got it. He was more intrigued by Thais at first. The more time he spent with her, the more that intrigue turned into blatant need for her. I want to say he made it easy for her, but with so much action going on around them, he didn’t take time to play any games. He wanted her and he focused on proving it to Thais. This book was provided by NetGalley for my honest opinion. All opinions are my own.